there would be Lok Sabha polls in the entire country, assembly polls Andhra Pradesh, Odisha and Sikkim and bye elections to legislative assemblies of some states. But assembly polls in Arunachal Pradesh found no mention in the sarkari circular. The Northeastern state of Arunachal Pradesh will go to polls on April 9, and both the assembly and Lok Sabha polls are being held on the same day. In fact, the Election Commission’s decision to hold simultaneous assembly and Lok Sabha polls in Arunachal Pradesh was taken a week after three election commissioners had held a press meet in Delhi's Vigyan Bhawan to announce the election dates. So, the state's elections did not figure in EC's first booklet on election dates. 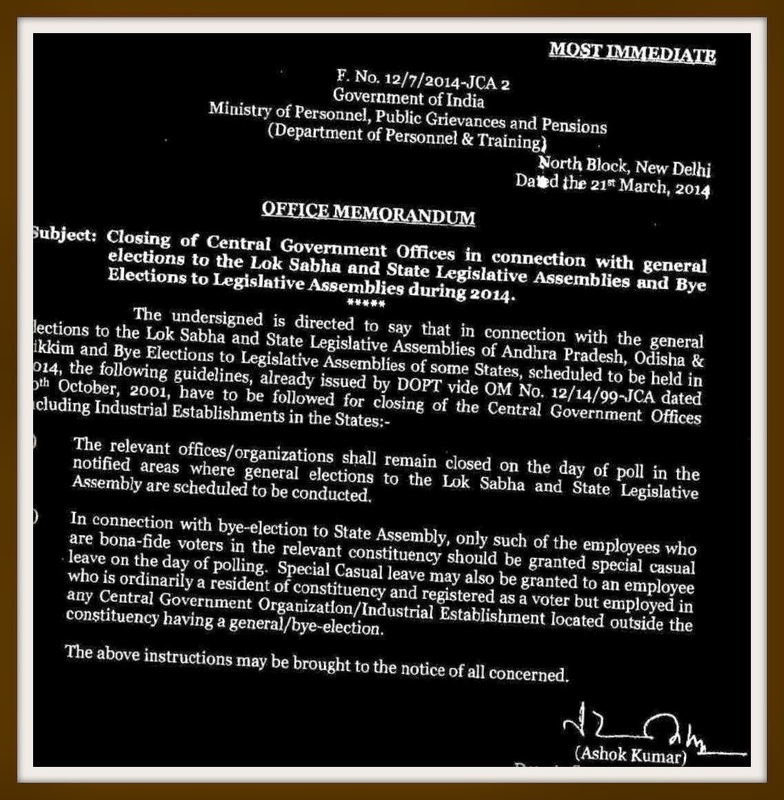 The DoPT office memorandum is related to closing of Central government offices in connection with general elections to the Lok Sabha and state legislative assemblies and bye elections to legislative assemblies during 2014. Office memorandum, or OM, is basically a circular connected to two or more Central government departments. Technically, the omission of Arunachal Pradesh from the OM will make no difference in closure of offices, as the assembly and Lok Sabha elections in the state will take place in the state on the same day. But the question remains how come a responsible department may ignore assembly poll of a state when the OM mentioned about bye-polls too. “The relevant offices/organizations shall remain closed on the day of poll in the notified areas where general elections to the Lok Sabha and State Legislative Assembly are scheduled to be conducted,” the OM said. So far as bye-poll is concerned, the OM has gone into some more specific points. “In connection with bye-election to state assembly, only such of the employees who are bona-fide voters in the relevant constituency should be granted special casual leave on the day of polling. Special casual leave may also be granted to an employee who is ordinarily a resident of constituency and registered as a voter but employed in any Central Government Organization/Industrial Establishment located outside the constituency having a general bye-election,” it added.